The Barry Hills-trained Red Clubs gained a deserved Group One victory in the Betfred Sprint Cup at Haydock under the handler's son Michael. French raider Marchand D'Or took second, while Balthazaar's Gift ran a big race to take third, but hot favourite Sakhee's Secret finished out of the money after having every chance. A total of 16 horses will go to post in Saturday’s £300,000 Group One Betfred Sprint Cup, the highlight of the Flat season at Haydock Park. Sakhee’s Secret, who created such a favourable impression when landing the Darley July Cup at Newmarket, is the 11/10 favourite with Betfred. Trained by Hughie Morrison, Sakhee’s Secret is unbeaten in four outings this season. He is sure to face some stiff opposition in the six-furlong contest including from French challenger Marchand d’Or, who finished fourth behind Sakhee’s Secret at Newmarket before landing the Group One Prix Maurice de Gheest at Deauville for the second year in succession. Red Clubs, third at Newmarket, also takes his chance on Saturday. 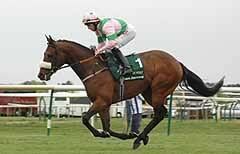 Asset will be partnered by Frankie Dettori and will be fitted with blinkers for the first time on Saturday. He has run some good races in defeat this year, including when third behind Soldier’s Tale in the Golden Jubilee Stakes at Royal Ascot. The gamble in the ante-post market this week has been Hellvelyn, now a 10/1 chance with Betfred, and his trainer Bryan Smart is predicting a big run from the three-year-old at Haydock Park on Saturday. Smart saddled Sheikh Rashid’s son of Ishiguru to a hat-trick of wins from five starts as a juvenile last term, including the Group Two Coventry Stakes over the distance at Royal Ascot, and believes the colt has major claims after two good efforts this season. A short-head victory from Borderlescott in the five-furlong Listed totepool Beverley Bullet Sprint Stakes at Beverley on August 25 showed that Smart’s charge is firing ahead of the Group One Betfred Sprint Cup. Hellvelyn missed the first part of the season due to a bruised foot and pulled muscle and was pitched in at the deep end on his seasonal debut in the Group One Darley July Cup at Newmarket on July 13, when he performed with great credit in finishing just over four lengths eighth of 18 behind Sakhee’s Secret. Smart continued: “I was delighted with Hellvelyn’s run in the Darley July Cup. The horse needed the race and he has come on and won since, so we’re hoping for a big run at Haydock on Saturday. Also declared for the Betfred Sprint Cup is Al Qasi, trained by Peter Chapple-Hyam and successful in a Group Three contest at the Curragh last time out. North Yorkshire-based Kevin Ryan is triple-handed with Advanced, last year’s third Amadeus Wolf and Wi Dud while Balthazaar’s Gift, a Group Three winner at Ascot this season when he defeated Al Qasi, represents Luca Cumani. Somnus won the Betfred Sprint Cup in 2003 and also finished a short-head second in 2004 as well as finishing fourth for the past two years. His trainer Tim Easterby also runs Fayr Jag. John Dunlop, successful four times before with Invincible Spirit in 2002 as well as Lavinia Fontana (1994), Habibti (1983) and Runnett in (1981) is double-handed with ex-Italian performer Per Incanto and Scarlet Runner, while Mick Channon’s stable is represented by Mutawaajid, a smart performer in Australia but not seen at his best in Britain so far. Completing the field is Sierra Vista, successful in the Group Two Temple Stakes at Sandown earlier this season. The going at Haydock Park is currently good to firm, good in places. Excitement is building as Haydock Park prepares for an outstanding renewal of its showcase Flat race, the £300,000 Group One Betfred Sprint Cup, which takes place over six furlongs at 3.10pm on Saturday, September 8. The north-west track’s only Group One contest of the Flat campaign invariably attracts the best sprinters in Europe and this year is no exception, with the Hughie Morrison-trained champion sprinter-elect, Sakhee’s Secret, poised to stretch his winning sequence this term to five. The impressive Group One Darley July Cup winner will bid to confirm his superiority over the Peter Chapple-Hyam-trained Dutch Art, who was runner-up at Newmarket before filling the same spot behind Marchand D’Or in the Group One Prix Maurice de Gheest at Deauville on August 5. Marchand D’Or’s trainer Freddie Head is confident of a big run from his charge, who is the current star of the French sprinting division, while Jeremy Noseda is poised to unleash his Group One Golden Jubilee Stakes hero Soldier’s Tale, who has not run since winning at Royal Ascot in June. A host of top-class sprinters make up the fantastic supporting cast, including the Chapple-Hyam-trained Al Qasi and his four-timer seeking stablemate Tariq, as well as the Barry Hills-trained Darley July Cup third Red Clubs. Balthazaar’s Gift and Hellvelyn are also set to tackle the Betfred Sprint Cup at Haydock. The former, trained by Luca Cumani in Newmarket, put up his best run this season when victorious in the Group Three Hackwood Stakes at Ascot in July, while the latter recently won a Listed five-furlong race at Beverley on only his second start as a three-year-old. Asset, owned by by Highclere Thoroughbred Racing, who found seven furlongs too far when runner-up to Tariq in the Group Two Betfair Cup at Goodwood on July 31, is seeking revenge on both Sakhee’s Secret and Soldiers Tale after finishing sixth in the Darley July Cup and third in the Golden Jubilee Stakes. Another of Highclere Thoroughbred Racing’s syndicates enjoyed victory in the Group One Haydock race with Tamarisk, trained by Roger Charlton, in 1998. The Betfred Sprint Cup, generously sponsored for the second year by the world’s largest independent bookmaker, is the highlight of a superb seven-race card on Saturday, September 8, while Haydock Park also races on Friday, September 7, PFA Centenary day. The going at Haydock Park is currently good to firm and the forecast is for generally dry conditions for the rest of the week. A thrilling showdown is on the cards at Haydock Park on Saturday, September 8, as the £300,000 Group One Betfred Sprint Cup promises to bring together the best sprinters in Europe. The six-furlong showpiece has 38 top-class contenders remaining at the first forfeit stage, including this season’s star turn, the Group One July Cup winner Sakhee’s Secret, and last season’s Betfred Sprint Cup hero Reverence, as well as France’s top speedster, the Freddie Head-trained Marchand D’Or. Marchand D’Or has proven himself to be one of Europe’s leading sprinters in the past two seasons and captured the Group One Prix Maurice de Gheest for the second year in succession at Deauville on August 5. The grey Marchand De Sable gelding swooped late to collar Dutch Art in the closing stages of the six and a half furlong contest, with Silver Touch third and crack Australian speedster Bentley Biscuit back in seventh. That victory followed a solid run at Newmarket in July when, despite finding his path momentarily blocked two furlongs from home, Marchand D’Or ran on to take fourth in the six-furlong Group One Darley July Cup, two lengths behind Sakhee’s Secret. Head continued: “I thought the July Cup was a good race. Perhaps the going was a bit firm for him that day and I wonder if he handled the ups and downs of Newmarket as that was a bit new for him. It was in fact his first Group One six-furlong race on turf. “He was impressive at Deauville last time and ran a very good race. I think he has improved a bit on last year - I thought it was a better race this year. “I think he will run well in the Betfred Sprint Cup but you always need a bit of luck. There will be a lot of runners and the draw may be important. The good thing is that my horse won’t mind if the going is a little bit on the soft side. Sakhee’s Secret, unbeaten in four starts this season, is the star of the sprinting division so far this term following his scintillating victory in the Group One Darley July Cup at Newmarket. Hughie Morrison’s charge defeated a top-class field that included Dutch Art, Red Clubs, Marchand D’Or, Dandy Man, Asset, Hellvelyn, Mutawaajid, Amadeus Wolf, Prime Defender and Balthazaar’s Gift. Dual Group One winner Dutch Art has filled the runner-up spot on his last two starts behind Marchand D’Or in the Prix Maurice De Gheest and Sakhee’s Secret in the Darley July Cup. The three-year-old, trained by Peter Chapple-Hyam, could be joined in the field by stablemates Al Qasi, winner of a Group Three over the distance at the Curragh on August 12 and Group Two Betfair Cup victor Tariq. Reverence secured the Group One Nunthorpe Stakes at York over five furlongs last season prior to holding Quito by a neck to collect the Betfred Sprint Cup on his next start. The Eric Alston-trained gelding was fourth to Balthazaar’s Gift in the Group Three Hackwood Stakes at Ascot on July 27. Soldier’s Tale, trained by Jeremy Noseda, proved too strong for crack Australian sprinter Takeover Target when taking the Group One Golden Jubilee Stakes at Royal Ascot in June. Aidan O’Brien could be represented by the brilliant and enigmatic George Washington, who could have his first start over six furlongs since his juvenile days, as well as Group One Poule d’Essai des Poulains winner Astronomer Royal and Theann, a Group Three winner at York on July 13. The Mick Channon-trained Group Three winner Silver Touch was third to Marchand D’Or at Deauville before finishing fifth to Red Evie in the Group Two CGA Hungerford Stakes at Newbury on August 18, and could be joined by stablemate Mutawaajid, a Group Two winner in Australia. Australian handler Peter Moody could field Magnus, a Group One winner in his homeland, who was third to compatriot Miss Andretti in the Group Two King’s Stand Stakes at Royal Ascot. The Tim Easterby-trained Somnus won the 2003 renewal of the Betfred Sprint Cup and was runner-up to Tante Rose in 2004. He has filled fourth spot in the past two editions of the contest behind Goodricke (2005) and Reverence (2006). Stablemate and fellow Group One winner Fayr Jag may also take his chance. The Andreas Lowe-trained Electric Beat is a Group Three winner at the distance in Germany, while Irish raider Dandy Man, one of seven remaining entries from Ireland, was runner-up in the King’s Stand Stakes and ran a respectable fifth in the Darley July Cup.